“My artwork cannot change the world, but I hope to help uncover positivity within individuals on a small scale"
Next time you fall asleep on the subway, be prepared to wake up and find yourself part of a sublime work of art. Thai monk-turned-artist Pairoj Pichetmetakul has been painting the people of New York for more than three years, and the subway system is one of his favorite places to document the city he now calls home. 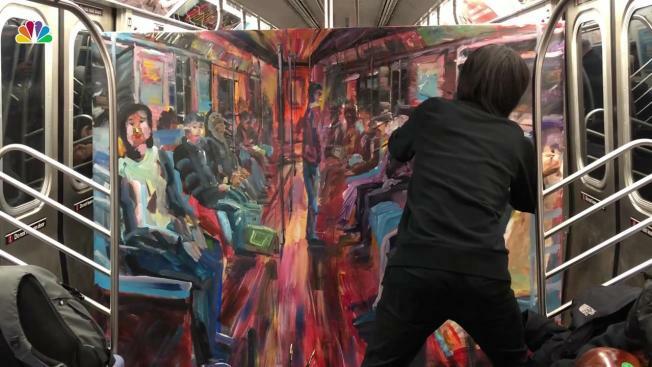 As of late, he’s been spotted with his paintbrushes, palette and a canvas that barely fits in the subway carriage, journaling the travels of straphangers in bright acrylic paint from Queens south. Since starting out drawing people in a sketchbook three years ago, he now estimates he has 50 to 100 large paintings done on the subway. “This is my subway journal daily, I paint on the train anytime I take the subway,” he says. On a frigid Thursday last week NBC 4 set out to meet Pichetmetakul at the Jackson Heights Roosevelt Avenue station in Queens for one of these moving painting sessions. We found him walking through the station with his wife Jitraporn Lithongkul, heaving along a giant canvas. 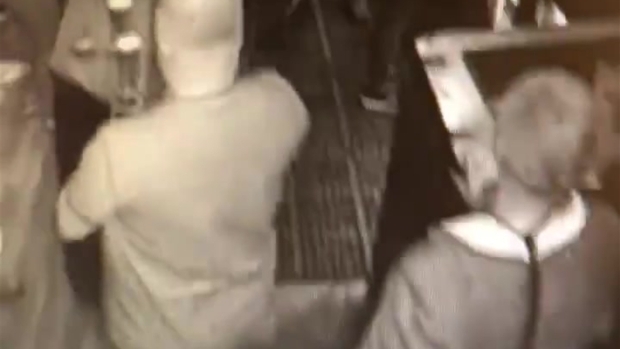 It measured just less than the width of a subway cart, and was almost as tall as him. But if Pichetmetakul is self-conscious of his process, you couldn’t tell. As we board a downtown E train he edges the canvas into position, leaning up against the central pole, whips out his paints and gets to work. Straphangers-turned-models reactions span the gamut from typical-New York nonplussed, to awe, to annoyance. While on the train Pichetmetakul is sometimes faced with subway riders who see his art as dangerous because the canvas is so large, but others take pictures and videos and tell him how amazing his artwork is. As we speed downtown subway riders fill the cart to watch Pichetmetakul paint those in front of the canvas. The artist even lets a small child put a finishing touch on the work. “Every day I use the subway but I think it’s a waste of my time to just sit down and sleep on the train. So many people sleep on the train, so I had the idea: why don’t I paint them to record everything. Some people are sleeping, or on their phones or reading a book,” he explains. While this is his most visible project, the artist has spent years working on a kindness project to help the homeless. The former-monk -- who remembers trying to avoid stepping on insects in Bangkok -- had a confronting experience when he moved to San Francisco in 2013. He saw an elderly homeless man being beaten on the street. Ever since then, he has used his art skills to give back to the homeless population. “The paintings I do on [the] subway [are] just practice,” Pichetmetakul says. His passion project is out on the street of New York, where Pichetmetakul will speak with homeless people, asking them their name and about their life and their dreams, before gently asking their permission to paint their portrait. As on the subway, the canvases are expansive, and the painting process often draws a crowd. When Pichetmetakul is finished he gives all the tips from the process and the painting to his subject. He says sometimes the homeless person will keep the painting, but other times they will sell it, and he is happy for them to do whatever brings them more benefit. “My artwork cannot change the world, but I hope to help uncover positivity within individuals on a small scale, by example, through the mechanisms of art and unwavering positive engagement,” he says.